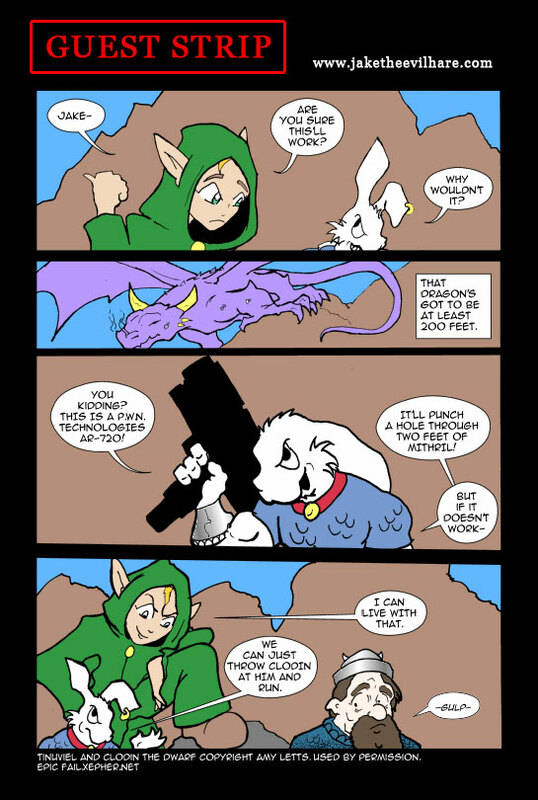 This week in Epic Fail: Tinuvielle and Jake (the Evil Hare) plan to test whether guns blow Dragons away, but they have a back-up plan if it doesn’t work. Creator’s Commentary: Poor Clodin! Sam Medina of Jake The Evil Hare seems to have it in for him! Besides Jake the Evil Hare Sam Medina also makes a fantasy webcomic called Darkfell which is really good, and you should check it out. On a related note he has recently launched a Novel called Katrina the Dragon Slayer which I am reading at the moment and enjoying immensely. Sam has drawn Epic Fail a Guest Strip before and here’s a link to it if you haven’t seen it.